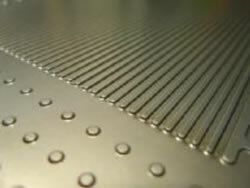 SYVEC developed a bi-polar plate for fuel cells, which has surface texture. 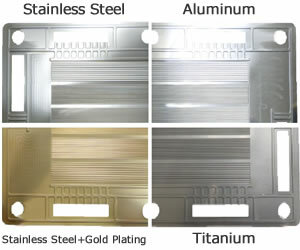 It can be expected that the required shape of metal bi-polar plate will be more difficult as fuel cells become more and more high-performance and high-efficiency. SYVEC has been developing bi-polar plates for fuel cells for more than a decade, and we have consistent results from die development to quality assurance of stamped parts. SYVEC made three different-shaped channels in one plate with four different materials. We made 3 kinds channels which have different dimension. This flexible forming technique would meet customer’s requirement. Fig.1 shows a cross section of a bipolar plate SYVEC designed originally. 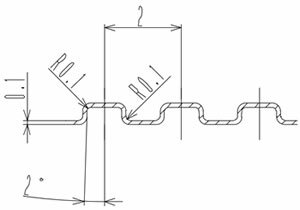 Compare to the conventional ones, SYVEC set the “channel pitch”, “wall angle”, and “inside radii” more difficult to stamp and developed the forming skills. We used 1mm-thick-stainless steel and titanium for this. 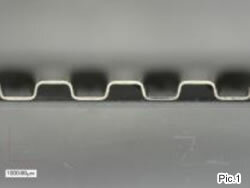 As you can see in Fig.1, the length of channels in a cross section becomes about 1.3 times more of when it was flat, so the material tends to have sink marks after stamping. However, if you see Pic.1, you will find that the material was stamped and stretched evenly. 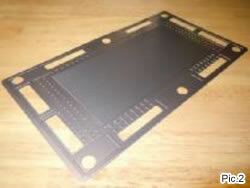 In Pic.2, you can see the flatness of the stamped metal plate. SYVEC hopes to contribute to the development of high-performance and high-efficiency fuel cells by making stamped metal bi-polar plates. SYVEC is now preparing for providing metal bi-polar plates for fuel cells at lower cost in large volume, as a part of a member of next generation society.